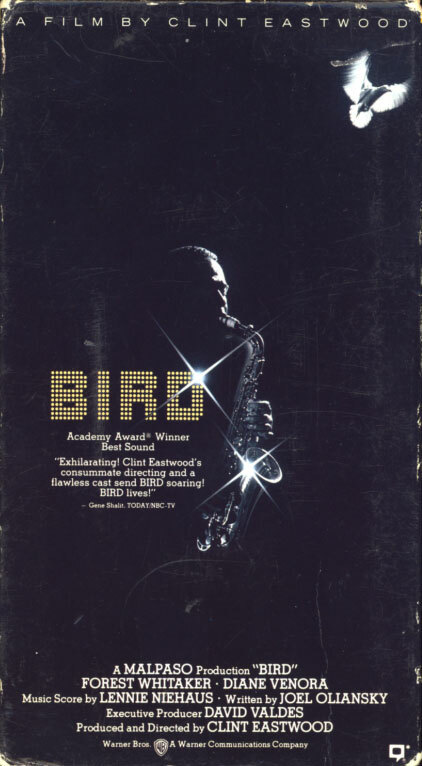 Bird on VHS. Starring Forest Whitaker, Diane Venora, Michael Zelniker. Directed by Clint Eastwood. 1988. The year: 1946. The event: Oakland’s “Jazz at the Philharmonic.” The music streaked into the unknown, daring listeners to grab hold and fly there too. On stage was the creator of those new sounds: Charlie “Yardbird” Parker. In the crowd was the 16-year-old who would someday bring Parker’s extraordinary story to the screen: Clint Eastwood. The Dead Pool on VHS. Starring Clint Eastwood. With Liam Neeson, Patricia Clarkson, Evan C. Kim, David Hunt, Jim Carrey. Directed by Buddy Van Horn. 1998. What happens when you put criminal scum behind bars? You become famous, that’s what. TV people want sound bites for the evening news. Writers want your life story. And sleazoid creeps want you dead. 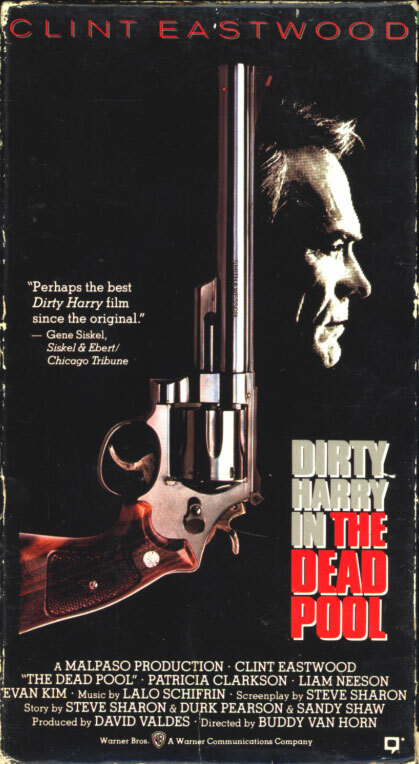 Being famous isn’t San Francisco Detective Harry Callahan’s style. He doesn’t appreciate being lumped in with a rock star, a film critic and a talk show host. Especially because those three are dead. They’re murdered celebrities whose names are in an underground betting pool called The Dead Pool. Now Harry’s found another well-known name on the list: his. The Outlaw Josey Wales on VHS. Starring Clint Eastwood. With Sondra Locke, Chief Dan George. Directed by Clint Eastwood. 1976. As The Outlaw Josey Wales, Clint Eastwood gives a hard-hitting portrayal reminiscent of his “Man With No Name” from A Fistful of Dollars, the role that brought him international acclaim. 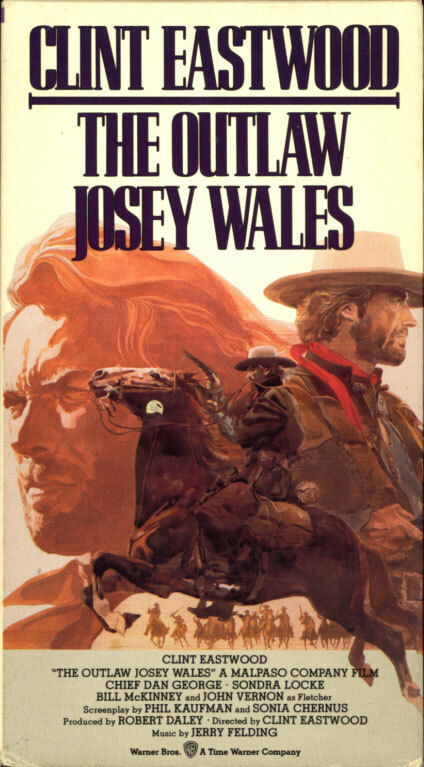 But unlike that other mythic outlaw, Josey Wales is a man with a name… and heart. That heart becomes increasingly evident as the story unfolds. After avenging his family’s brutal murder, Wales is on the lam, pursued by a pack of killers. He prefers to travel alone, but a ragtag group of outcasts (engagingly played by an excellent support cast that includes Sondra Locke and Chief Dan George) is drawn to him — and Wales can’t bring himself to leave his motley surrogate family unprotected. Undoubtedly, Eastwood is. That bad step became Sergio Leone’s A Fistful of Dollars, and it boosted Clint Eastwood to international stardom. The Outlaw Josey Wales is a worthy successor to that unforgettable milestone. Selected by Time as one of 1976’s 10 Best Films, it’s as enthralling an entertainment as will ever gallop by!